Extra-extra, read all about it! There’s a new trend that you must know about! It’s called oil pulling, and the word has gotten out that Hollywood celebrities are raving over it. Although the popularity is growing, your dentist is concerned about the lack of evidence that this process actually works. Dr. Megan A. Shelton dives into this new phenomenon to set the record straight, so before you rush out to have this procedure done, read further. Labeled as an ancient medicinal remedy, oil pulling is said to use natural substances to clean and detoxify teeth and gums. There are also claims of it acting as a tooth whitening agent, with added benefits of aiding in gum health by fighting certain harmful bacteria in the mouth. The process involves the swishing of oil (usually sesame, sunflower or coconut) in the mouth for up to 20 minutes daily. 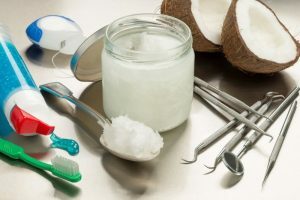 The theory is that because the oil is similar in texture to the plaque that damages gums and teeth, it can dissolve it. Some of the claims of benefits include improved skin conditions, arthritis, asthma, headaches, hormone imbalances, infections, liver problems and more. This is a very attractive list of superlatives, but the problem is that there is no evidence to verify them. And from your dentist’s standpoint, it is dangerous to begin recommending certain treatment protocols to the public without taking the time to thoroughly vet them. Another specific claim is that this process can prevent gingivitis and even heal cavities. This is inconsistent with the science of dentistry and oral care, as a cavity is damage to the tooth structure, and there is no evidence of how swishing oil in the mouth can restore damaged structure to its prior state. At best, improved oral hygiene could slow the progression of decay, but that does not denote healing. Dentists fear that the public could be misled into assuming that a growing oral problem has been miraculously fixed, unknowing that it continues to worsen. Thus, something that could have been nipped in the bud early, mushrooms into an unnecessary behemoth. Until the research is finalized on oil pulling, it’s best to stick to what we know for sure works. They are simple, but proven effective protocols for defense against the harmful effects of bacteria in the mouth. Proper Oral Care – Make sure to thoroughly brush and floss your teeth at least twice daily. Regular Checkups and Cleanings – The American Dental Association recommends maintaining six-month checkups and cleanings as the backbone of your oral care plan. Passionate about the field of dentistry since the age of 12, Megan A. Shelton, DMD earned her undergraduate degree from Wichita State University, and her Doctor of Medicine at the University of Louisville School of Dentistry. She holds professional memberships with The American Dental Association, The State of California Dental Association, and the San Diego County Dental Society, and is certified in several advanced treatment options. She practices at Polished General Dentistry and can be reached for more information through her website.